The Kenya High Commissioner to the UK, H.E Manoah Esipisu has graciously extended an invitation to members of The Kenya Society to attend the upcoming 55th Kenya National Day celebrations on 12th December 2018 at the International Maritime Organisation, Delegates Lounge from 12:30 – 14:30 hrs. 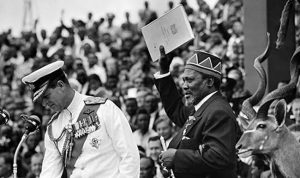 Following the ‘Save the Date’ notice sent last week, we are now pleased to inform our members that the reservation desk for the Jamhuri Day Reception is now open on Eventbrite. Registration details have been sent to all members whose accounts are currently paid up and active. As mentioned, the invitation is for 40 guests and bookings will be limited to a ticket per individual member* on a first come first serve basis. Please book early to avoid disappointment. Should you wish to attend but miss a reservation slot, please contact Pamela at the Secretariat and she will add your name to the waiting list. Formal invitations will follow in due course.